1. Pull the ski gear from the basement. We do this in late September. 2. Have the kids try on their ski boots in the living room, even with no snow in sight. 3. Orchestrate a fall ski fashion show where everyone put on their ski outfits from last year. Make it fun by encouraging the kids to strut their stuff around the house in full ski fashion, even goggles and gloves. It’s fun, but the goal is to be sure nothing is too tight, when the forecast turns white. You will have time to hit local ski swaps and sales before snow flies. 4. Do wall sits each morning while you wait for your hot oatmeal, coffee or the kids’ hot cocoa. Its time to get fit for skiing. 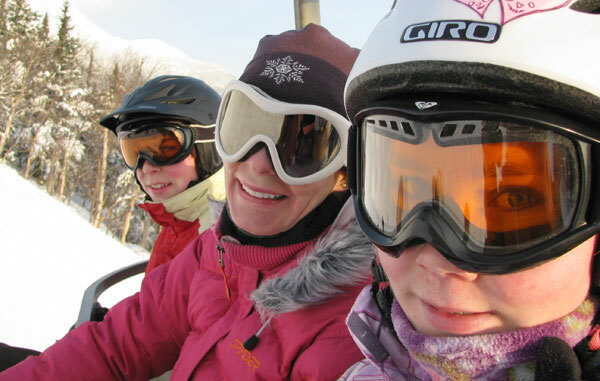 Bike, hike, do squats… the whole family should do ski exercises daily. 5. Tell the kids to “be really good” in case Santa is checking his list for new skis. 6. Mount snow tires and ski racks, long before the first snow so you are ready to go. 7. Reserve that first ski trip, get your season passes, shop online then call for the best deal. 8. Set your internet browser to snocountry.com and sign up for snow mail from your favorite ski resort for deals and snow dump alerts. 10. Plan a family ski movie night. Get tickets for the new Warren Miller movie premier, free lift tickets are often a door prize, or rent a ski movie classic from Greg Stump, Matchstick Productions.